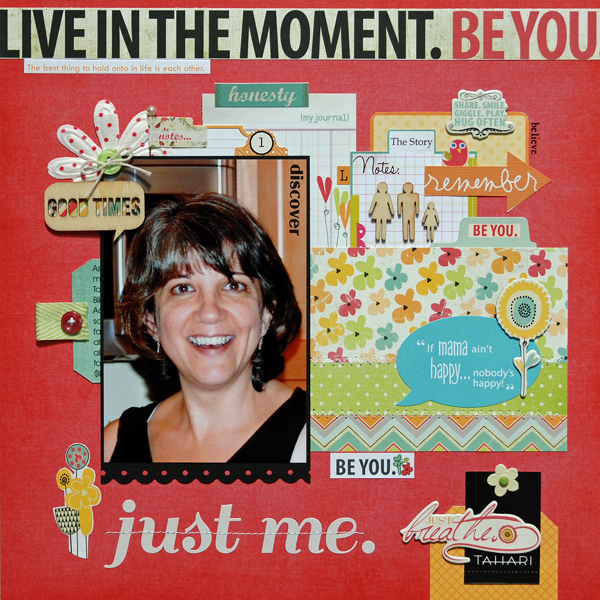 i have to remember to do a layout about me every once in awhile! great job here! Great layout. The quote bubble made me LOL. Love the way you did the journaling to capture what you like, what you're reading and doing at this period. That's such a good idea! I loveeeeeeeeeeee that you did a page about you!! This is GORGEOUS!! I love love love the colors and LOVING the wood embellies!!! So important to do a page about you too! This is great and love all the colors! Cute layout and so important to have yourself in your books. Love the word bubble. Great idea Lisa - a lot of us don't get on the pages much less in front of the camera!! Love the page - very cool and fun. This is so adorable, Lisa! And such a beautiful picture of you!!! I just love your style and so glad you scrapped your own photo! I LOVE this page, Lisa! Such a great photo of you, too. And I love that quote there on the right as well. It's a nice idea to have a snapshot of YOUR life in your scrapbooks. Great page! Great page! I love this picture of you!